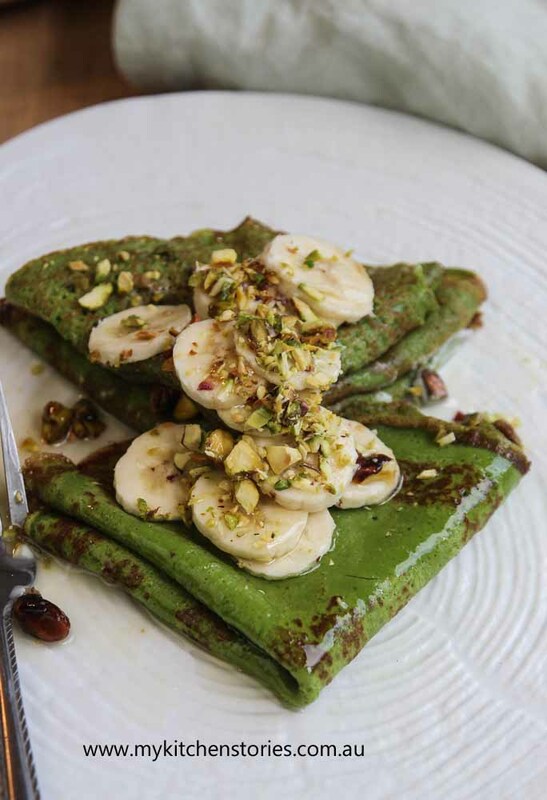 These Green Pancakes Bananas and Honey Lemon Syrup are the best surprise you can have. So just why are they a surprise? Well it’s about the spinach, the beautiful spinach that make these so green and so very good for you. To be honest they are just as good stuffed with a cheesy chicken mixture. Yes, these amazing pancakes go with savoury or sweet. I told you they are special. 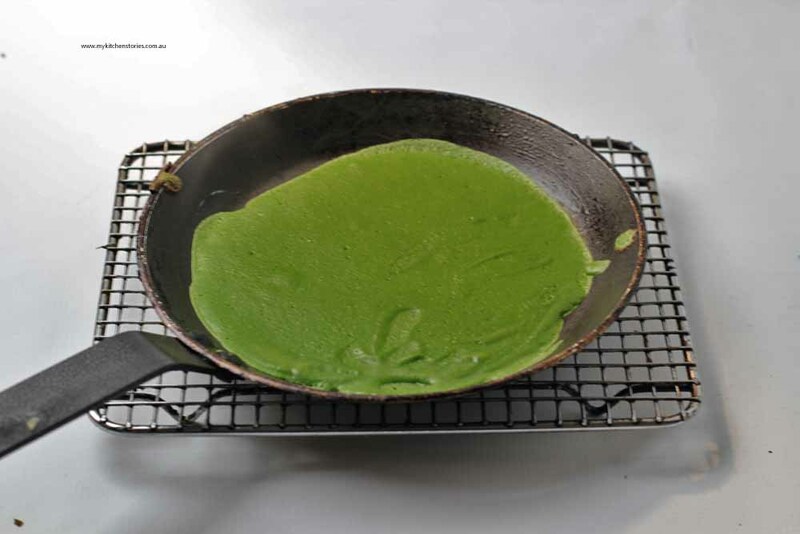 I never thought to include spinach in a pancake till I saw this recipe on Tieghan’s blog, Half Baked Harvest. I went looking for other recipes on the internet after that and discovered a world of pancakes just like these. 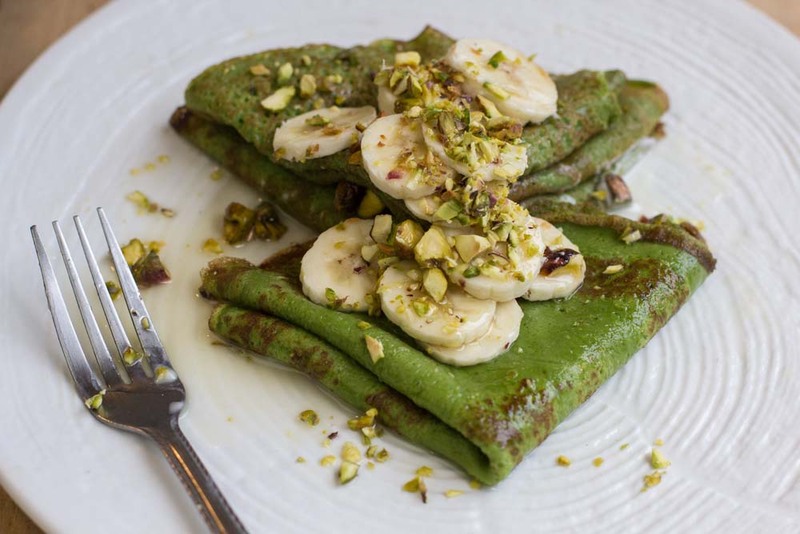 They are really best made like crepes thin and delicate, although I have made them as fluffy green numbers too, but you need to adjust the recipe for that. Fold these fine thin ones over, slathered with a spoon of plain or sweetened yoghurt. I love them with sliced bananas but I guess they would be nice with all kinds of berries too or maybe a berry sauce. Now there’s a good idea. What about raspberries or a blueberries either fresh or frozen and just lightly heated with some honey? As well as eating them for brunch with fruit I also made a big batch of these and filled them with a saucy chicken and vegetable mixture. I covered them with extra cheese sauce and grated cheese and popped them in the oven to bake. Skater can’t resist this kind of thing. That means a double dose of vegetables for the unsuspecting….. Believe it or not though they really are the best with fruit and a honey lemon syrup. Give them a try and let me know. Put the eggs, milk, banana, spinach and butter into the blender and blend until smooth and there are no spinach bits left . To make the honey lemon syrup put the honey and lemon into a pot or into a bowl in the microwave and cook till hot. Let it just come to a boil them pour into a jug or directly onto prepared pancakes when plated. Spread each pancake with a bit over a teaspoon of yoghurt, then fold up. Separate onto serving plates or onto a platter. 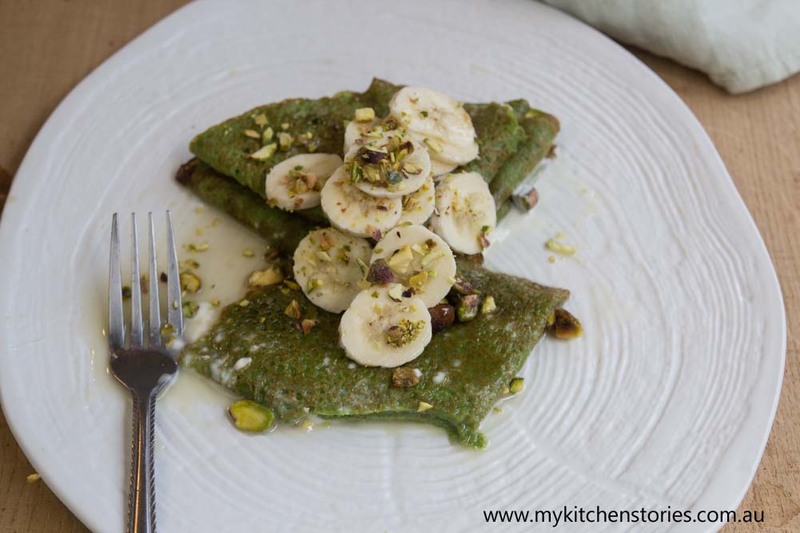 Well I’m well and truely behind the times then because I’ve never heard of green pancakes with banana and honey! I like the thought of having them with cheese sauce and chicken though I’m sure if I served them up to Rich sweet he’d wolf them down! Hi nancy. 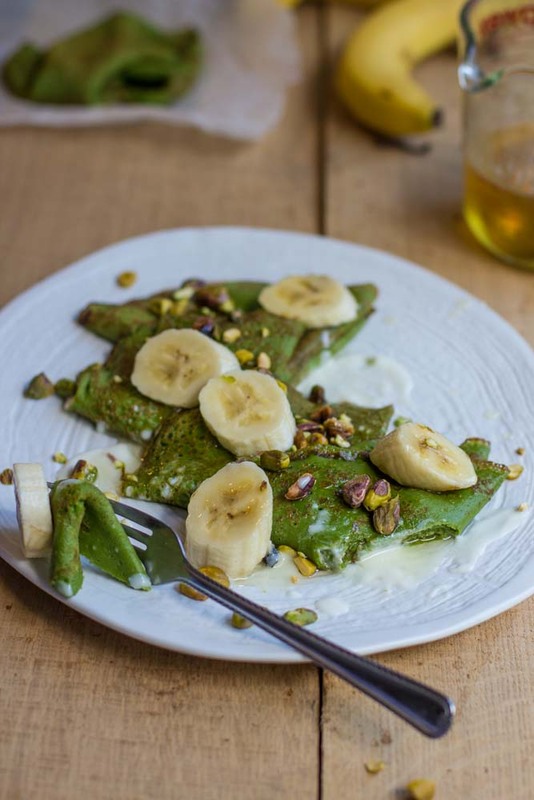 Its the pancakes made of spinach and banana themselves that are all the rage and a great idea too. Thanks for visiting . I really want to try these!! Looks bloody amazing. Hi Mon, aw thanks mate…. What a great idea! I love how vibrant these look and given spinach blends so well into green smoothies I can imagine a pancake version being equally good. Hi Kari, I thought you might like these. 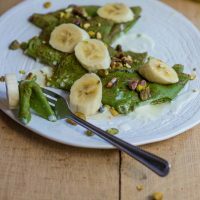 they are quite a good idea to use spinach and bananas in the same meal! I’m so curious about these I’ve never heard of them before. Thanks so much for sharing with YWF, you are a bit clever! Oh wow, I love this Tania. That colour is incredible and I bet they taste great. These are beautiful! and what a great way to get spinach into something delicious. These look great – love pancakes, and the added bonus of healthy with the spinach makes them perfect. What a creative dish, Tania, and great way to get more spinach into a diet. I have to admit — and this is in no way a comment about the pancakes — that I’d eat a shoe if it was covered in that honey-lemon syrup. It sounds that delicious! 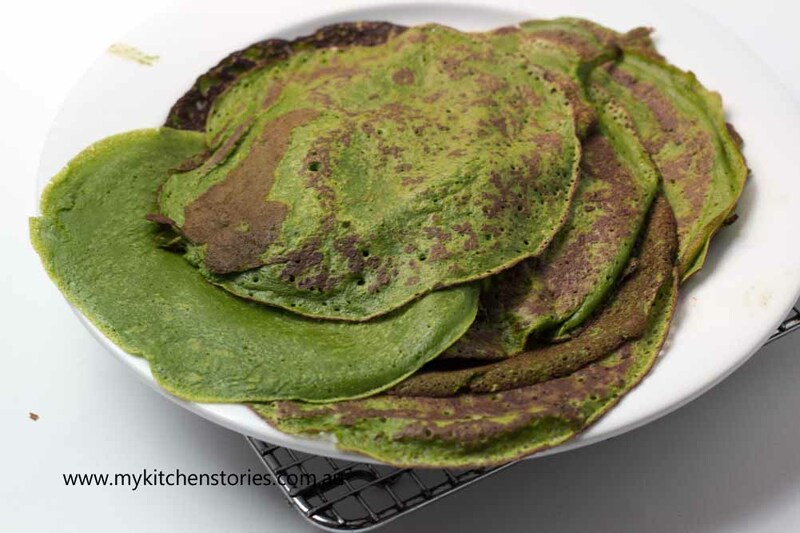 I thought these would be matcha pancakes but spinach sounds much more nutritious! Tastiest way to eat your greens, I reckon! Hello Julie. Thanks we like green!